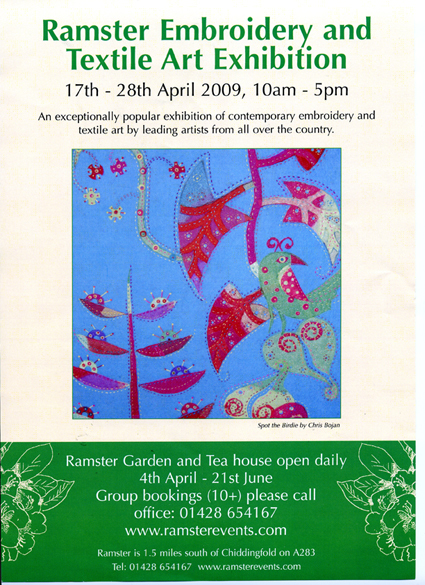 Ramster is very well known for its prestigious bi-annual Embroidery Exhibition. Now in its tenth year, the Ramster Embroidery Exhibition was open from the 17th. - 28th. April 2009 - 10am - 5pm. The 2009 exhibition was even bigger with over 300 embroideries, selected from an invited list of the countries leading textile artists, it was one of the largest displays of contemporary embroidery in the country and attracted over 2000 visitors. The exhibits were beautifully hung in the stunning setting of the splendid Jacobean Hall and Great Drawing Room by an expert team from the Embroiderers Guild. Eleven members of OTT displayed examples of their work as part of this prestigious Exhibition.